Ellen has been teaching Pilates since 2000. 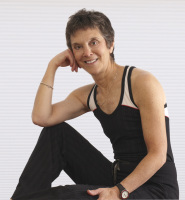 She is classically trained and certified on all levels through Power Pilates (NYC). She has been teaching in New York City and on the East End of Long Island at both her own studio in Greenport and in Sag Harbor with InBalance Studio. She is also a member of The Pilates Method Alliance and The Idea Health & Fitness Association. Prior to becoming a Pilates instructor, Ellen toured the country as a professional dancer/singer and often dance captain in the national touring companies of major Broadway musicals. She then became a talent agent—principal/owner of her own firm, The Manning Agency (NYC), an owner/partner of Harter, Manning, Woo (NYC and LA), and head of the commercial department of Gilla Roos (NYC). Ellen has exercised all her life, but when she was introduced to Pilates by several of the performers she worked with as an agent, she felt it offered her not only a superb low-impact work-out and a feeling of lasting rejuvenation after every session, but a true sense of mind and body integration and balance through dynamic and intelligent movement. She has also seen the long-term body alignment and improved energy and focus changes that consistent Pilates work achieves. She pursued training and certification in order to share these benefits with others and has found teaching Pilates to be an extremely rewarding and gratifying chapter of her life. She is delighted to be back doing body work and helping her clients achieve the remarkable results the Pilates method has to offer.